Until recently, I had never used a slow cooker before. I’ve had one for over 8 years that my sister gave me because at first I thought I would use it for making hot-process soaps. Yeah, I used to make soaps and spa products years ago and had a small home-based business but the market was saturated with soap makers so put my energy elsewhere. Anyhow, I never used it….sorry sis…I’m sure she wants it back now! ha! BUT wait, I finally put it to good use and can’t believe I waited this long. Slow cookers and crock pots are AWESOME! You get to dump stuff in and walk away for hours. You can go to work and dinner is ready when you come back home or the gym, run a few errands, go buy those shoes you saw the other day and voila, mealtime! Why didn’t I do this sooner? So I wiped off that dust and gave it a good scrub. I had been checking out a few recipes online for ribs, chili and stews but instead decided to make a pork roast, a pernil! 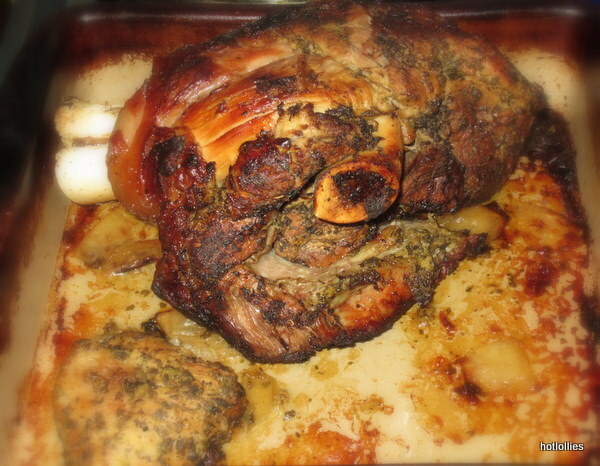 Pernil is a traditional pork roast made for special events in Spanish Caribbean homes, it’s often made during the holidays, Easter or any party for that matter. The main ingredients are simple but the flavors are huge. I quickly learned about the “mush” factor when making meats in slow cookers…not very appetizing. The skin doesn’t brown or gets crispy enough. What you can do is just finish the roast in the broiler for a couple of minutes on both sides and no one will ever know it was made in a slow cooker. Another great thing about cooking with a slow cooker is the meat is so tender it just falls off the bone! I got a small pork roast, about 4 1/2 lbs so it could fit easily in my 8 qt slow cooker. That’s enough meat for 6-8 people but if you’re not cooking for that many like myself, you can save it in the refrigerator or freeze what you’re not going to eat right away. This way you can use the pork to make several types of dishes. 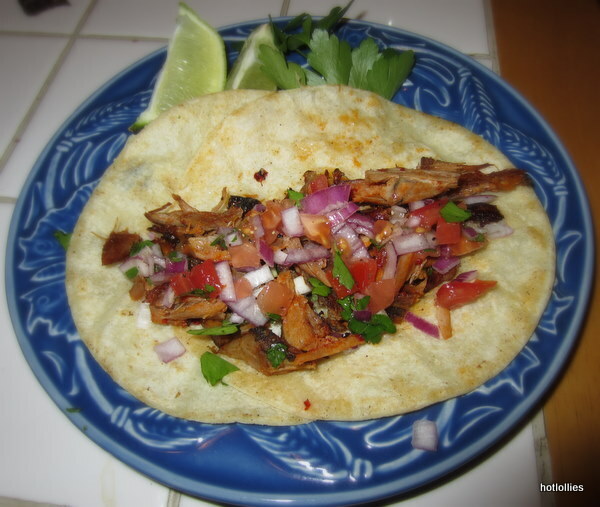 I made pork (carnitas) tacos, BBQ pulled pork sandwiches, had pork with ripe sweet plantains, there are so many options. Below are the tacos I made with just a little of the shredded meat. In the next few posts I’ll show you the other dishes I made using the roast. You can get really creative with this and once you have a well seasoned roast you can kick up the heat how ever you like. The idea is to get cooking and get creative! I’m going to try a pozole as well so wish me luck! 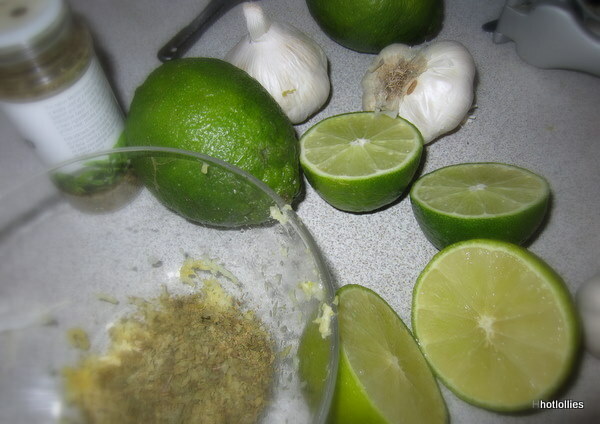 Mix garlic, lime, oregano, Adobo in a bowl and blend well. Spread mixture all over the roast. Really work it in and try to get it under skin. Poke holes in roast with a knife and stuff some of the mixture inside. Let roast marinate overnight in refrigerator. Turn on slow cooker and set to high heat. Spray the inside of the slow cooker with cooking spray or use butter instead. Toss in the chopped onion so the roast can rest on top of the onions, this will prevent roast from sticking or burning. Add roast and pour all of the mixture over the roast, close lid and cook for 6 hours. You can also cook on low heat and let it cook for 8 hours instead. Once roast is ready, carefully remove from cooker and place in roasting dish. Be very careful as roast will be very tender and you don’t want it to fall apart. Broil roast for about 3-4 minutes on each side to brown the skin as shown above. Toss the shredded pork with some of the red sauce in a pan and heat up a bit. Assemble your tacos by placing pork in tortilla, sprinkle with onions, tomatoes, cilantro, red guajillo sauce, hot sauce and squeeze of lime. I’m going to have to try this. It looks so good. I actually just purchased my first slow cooker and yesterday I made ropa vieja…yum. Will need to figure out a way to tweak it, so it tastes like my sisters, but it was really good. wow, that looks yummy! Never used a slow cooker. I think I will add it to my “wish list”! Yes, its perfect for us busy folks! Put it on your bday wish list! !